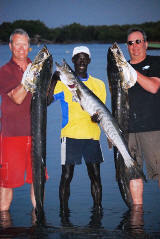 Chris and Simon from Grantham & second-time visitors to The Gambia fished for four days on the boat with Cpt. Assan aka 'Ninja'. 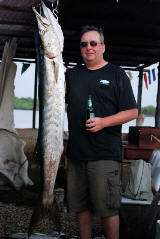 Trolling lures for the most part of the day along the coastline at Cape Point, Mantel, and Senegambia reefs � plenty of barracuda around, many strikes, seven barracuda boated, biggest 22lb. They finished their day light tackle bottom fishing on Mantel reef � a mix of species caught using local fresh shrimp for bait. 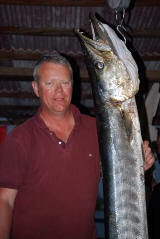 Back to the trolling grounds - not the same concentration of fish around � one barracuda boated on Cape Point reef. The rest of the day was spent fishing live bait, cut fish baits and shrimp over Mantel reef � mix of reef fish caught including red snappers. The decision was made to head-off to the mouth of the Gambia River (Barra) to troll some big deep water lures & target the large Guinean Barracuda. 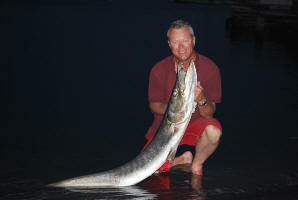 Trolling �Mann�s Stretch� 30+ & 40+ lures with a red-head sea-snake around the turn of the tide provided two hard strikes with one fish staying on for a 10 min fight before pulling the hook. In the afternoon they cruised into the creek system to target a pod of tarpon on a deep junction. 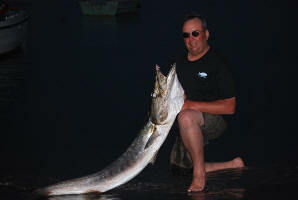 Multiple fish could be seen rolling - casting lures and jigs to the group but could not entice a strike from the tarpon. 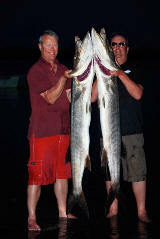 Back to the River mouth fishing the deep lures produced one Barracuda of 19lbs. The rest of the day was spent anchored on the sandbanks at Cape Point bay catching a mixture of fish including many good sized Butterfish.